Vintage From Paul is pleased to offer these Buffalo China Kenmore Green Restaurant Ware Berry Bowls. The Buffalo China Kenmore Green Restaurant Ware Berry Bowls have a pristine white body and a rim decorated with a green floral border. Each of the available Buffalo China Kenmore Green Restaurant Ware Berry Bowls is in superb condition havving no chips, cracks and showing little signs of use. The graphics are crisp, the colors vibrant. 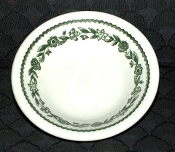 The Buffalo China Kenmore Green Restaurant Ware Berry Bowls measures 4-3/4 inches in diameter. The Buffalo China Kenmore Green Restaurant Ware Berry Bowls are marked with "Buffalo China, Made In the USA".